There are three different forms of hypertension which include primary hypertension, secondary hypertension and malignant hypertension. Generally hypertension may be asymptomatic or present with signs and symptoms such as blurred vision, palpitations, headache, shortness of breath and altered mental status. In malignant hypertension, the common signs may include retinal hemorrhage, retinal exudates , papilledema, present of fourth heart sound and displaced apex beat. Malignant hypertension is presented with diastolic pressure of more than 120 mmHg. Primary hypertension is also known as essential hypertension. Primary hypertension is associated with atherosclerosis and thickening of the hyaline of the vessel. 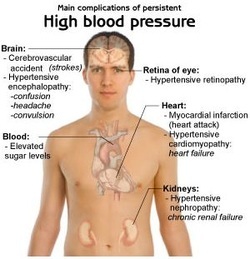 Primary hypertension commonly affecting elderly, smoking, diabetes, obesity and patient with positive family history. Primary hypertension may also present with increased in cardiac output as well as increased in the total peripheral resistance. The treatment of primary hypertension should focus on lifestyle modification and antihypertensive medication. Lifestyle modification may include cessation of smoking, loss weight, moderate intake of alcohol, reduced excessive salt intake and exercise. Medication may include, ACE inhibitor, beta blocker, alpha blocker, thiazide diuretics and calcium antagonist. The aim of the treatment is to maintain the blood pressure below 140/90 mmHg. Secondary hypertension is also associated with atherosclerosis and thickening of the hyaline of the vessel ( hyaline arteriosclerosis - mostly affecting the kidney and lead to benign nephrosclerosis). Secondary hypertension is commonly affecting patient who suffer from, acromegaly, Cushing syndrome, Conn syndrome, renal disease, hyperthyroidism, pheochromocytoma and due to certain side effects of the drugs such as NSAID, steroid and cyclophosphamide. Secondary hypertension may also present with increased in cardiac output as well as increased in the total peripheral resistance. The treatment of secondary hypertension should focus on lifestyle modification and antihypertensive medication. Lifestyle modification may include cessation of smoking, loss weight, moderate intake of alcohol, reduced excessive salt intake and exercise. Medication may include, ACE inhibitor, beta blocker, alpha blocker, thiazide diuretics and calcium antagonist. The aim of the treatment is to maintain the blood pressure below 140/90 mmHg. Malignant hypertension is a progression of primary and secondary hypertension. Malignant hypertension is presented with deposition of the fibrinoid in the walls of the arteriole with inflammation and necrosis (necrotizing arteriolitis) and the present of laminated, concentric onion skin thick of wall of arterioles. This phenomenon is known as hyperplastic arterioles. Malignant hypertension commonly affecting young african men.The treatment of malignant hypertension may include IV sodium nitroprusside. The common complication of malignant hypertension may include malignant nephrosclerosis and hypertrophy of the left ventricle. There will be phenomenon known as flea bitten kidney due to the ruptured of the glomerular capillaries. Malignant hypertension may lead to fatality. 1.Kimmelstiel, Paul, and Clifford Wilson. “Benign and Malignant Hypertension and Nephrosclerosis.” The American Journal of Pathology 12, no. 1 (January 1936): 45–82.3. 2.Vikrant, Sanjay, and S. C. Tiwari. "Essential Hypertension-pathogenesis and pathophysiology." Journal, Indian Academy of Clinical Medicine 2.3 (2001): 140-161.